Stabilization seeks to achieve internal and external equilibrium that is, to control the demand side of the economy, with the purpose of reducing size of government, inflation and quickly achieving a sustainable balance of payment position. 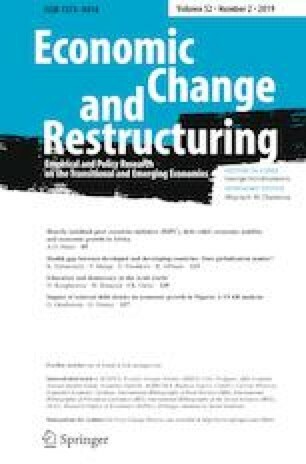 In this paper, I investigated the impacts of HIPC initiative and debt relief on economic growth and economic stability in Africa. I also identify the determinants of economic performance using the World Bank data for the period 1990–2015 with 5-year panels. The results show that this initiative causes economic instability in Africa. The results also indicate that the long run effect of debt relief on economic growth is positive but in the short run debt relief has no significant effect on GDP per capita growth. However, in both the short run and the long run, debt relief reduces external balance on goods and services deficit and has no effect on inflation. The main determinants of economic performance in Africa are control of corruption, political stability, regulatory quality and education. In this perspective, governments of African countries should promote good governance, educate their population and revise trade agreements to provide insurance for economic growth and economic stability.